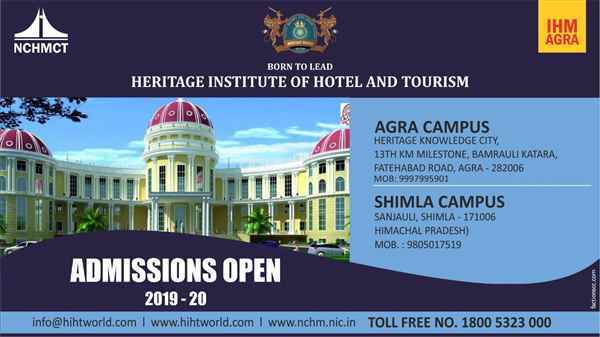 Heritage Institute of Hotel & Tourism (HIHT) is the oldest and most recognized Institute approved by AICTE, UGC, NCTE and affiliated to NCHMCT, AKTU & HPU & others. We have our campuses spread over two of the most important tourist destinations of the country: Agra and Shimla. At HIHT, we offer courses in hospitality and tourism administration where students learn the art of the trade through hands-on-experiences, from some of the best faculty members of the industry and academia. Heritage Institute of Hotel & Tourism provides the best possible infrastructure for pursuing high-quality Hotel Management Education. We run courses in: 3 years B.Sc. degree in Hospitality and Hotel Administration, 4 years Bachelors degree in BHMCT, 1 year Diploma in Front Office Operation, Bakery & Confectionery, Food & Beverage Service and Food Production, 3 years Bachelors degree in Tourism and Travel Management. Come join us today and be a successful hotelier tomorrow! 9997995925 When you call me, please mention that you found this ad on IndiaEducation Classified Ads.